The mountain shaped like a rice ball rising up from behind the signboard is Mt. Yaguradake (elevation 870 m). From its characteristic shape, Mt. Yaguradake has a history of serving as a landmark for the Ashigara-kodo (Ashigara Old Road). Mt. Yaguradake has been affectionately called “Takenokoshi” from long ago by the people living in the local area. The area around Minamiashigara City, where Mt. Yaguradake is a rare place, even in the world, where 3 plates are crowded together. If you gaze down with your eyes, the rise continuing from the Ashigara Plains to Oisokyuryo (Oiso Hills) spreads out and the boundary forms a beautiful straight line. That area just happens to be called the Kozu-Matsuda Fault and is located on the boundary of the Philippine Sea Plate and the North American plate. What kind of mountain is Mt. Yaguradake? The area near the summit of Mt. 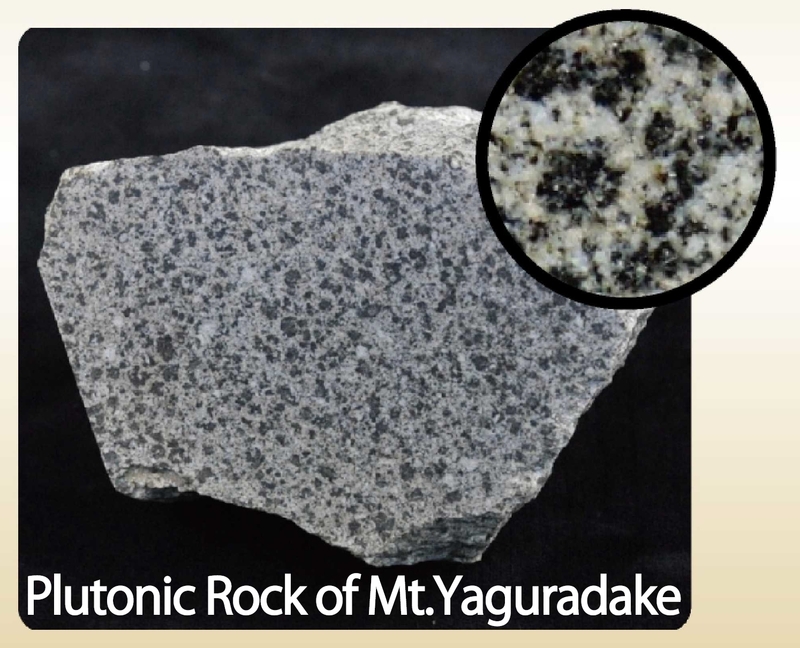 Yaguradake is made of rock called “Plutonic Rock” that formed by magma deep underground slowly, cooling and hardening. At one time, Minamiashigara was once at the bottom of the ocean sandwiched between Honshu and the Izu Block. About 1.15 million years ago, magma penetrated the stratum of the ocean floor. The magma did not erupt but instead solidified and by each of the ocean floor strata, rode on the Philippine Sea Plate and was pushed by the Izu Block coming from the south and rose up. Afterwards, the surrounding stratum of the ocean was weathered exposing the hard Plutonic Rock and became the current form. What kind of place is Mt. Yaguradake? What is so precious worldwide? Plutonic Rock solidifies slowly, deep underground and it takes many years before it came up to the surface. It took approximately 1.15 million years to come up to the surface and it is extremely new worldwide and there are no other examples of being pushed up to 870m. Mt. Yaguradake is a Geosite that tells us how dynamically this region has changed. When studied in detail, it is classified as quartz diorite even within Plutonic Rock. Quartz diorite is solid and is used for stone walls.